A light duty, liquid cleaning composition comprising: at least two different surfactants, lauryol ethylene diamine triacetate, a zinc inorganic salt, and water. U.S. Pat. No. 4,595,526 describes a composition comprising a nonionic surfactant, a betaine surfactant, an anionic surfactant and a C 12-C14 fatty acid monoethanolamide foam stabilizer. To achieve the foregoing and other objects and in accordance with the purpose of the present invention, as embodied and broadly described herein the novel, high foaming, light duty liquid detergent of this invention comprises a C 8-C18 ethoxylated alkyl ether sulfate, a magnesium salt of a C8-C18 linear alkyl benzene sulfonate, sodium salt of a C8-C18 linear alkyl benzene sulfonate, an alkyl polyglucoside, an amine oxide, a zinc inorganic salt, sodium salt of lauryol ethylene diamine triacetate, and water, wherein the composition does not contain a glycol ether solvent, an ethoxylated and/or propoxylated nonionic surfactant, an alpha olefin sulfonate surfactant, a polyoxyalkylene glycol fatty acid, a builder, a polymeric thickener, a clay, an alkali metal salt of ethylene diamine tetraacetic acid or hydroxy ethylene diamine tetraacetic acid, a sodium citrate, abrasive, silicas, tricloscan, alkaline earth metal carbonates, alkyl glycine surfactant or cyclic imidinium surfactant. wherein n is about 1 to about 22 more preferably 1 to 3 and R is an alkyl group having about 8 to about 18 carbon atoms, more preferably 12 to 15 and natural cuts, for example, C 12-14; C12-15 and M is an ammonium cation, alkali metal or an alkaline earth metal cation, most preferably magnesium, sodium or ammonium. The ethoxylated alkyl ether sulfate may be made by sulfating the condensation product of ethylene oxide and C 8-10 alkanol, and neutralizing the resultant product. The ethoxylated alkyl ether sulfates differ from one another in the number of carbon atoms in the alcohols and in the number of moles of ethylene oxide reacted with one mole of such alcohol. Preferred ethoxylated alkyl ether polyethenoxy sulfates contain 12 to 15 carbon atoms in the alcohols and in the alkyl groups thereof, e.g., sodium myristyl (3 EO) sulfate. Ethoxylated C 8-18 alkylphenyl ether sulfates containing from 2 to 6 moles of ethylene oxide in the molecule are also suitable for use in the invention compositions. These detergents can be prepared by reacting an alkyl phenol with 2 to 6 moles of ethylene oxide and sulfating and neutralizing the resultant ethoxylated alkylphenol. The concentration of the ethoxylated alkyl ether sulfate surfactant is about 1 to about 8 wt. %. An alkali metal or alkaline earth metal salt of the C 8-C18 linear alkyl benzene sulfonate or C8-C18 paraffin sulfonate surfactant can be used in the instant compositions. Examples of suitable sulfonated anionic surfactants are the well known higher alkyl mononuclear aromatic sulfonates such as the higher alkyl benzene sulfonates containing from 8 to 18 carbon atoms, more preferably 10 to 16 carbon atoms in the higher alkyl group in a straight or branched chain, C8-C15 alkyl toluene sulfonates and C8-C15 alkyl phenol sulfonates. 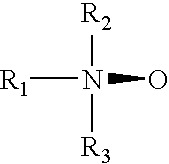 wherein Z is derived from glucose, R is a hydrophobic group selected from the group consisting of alkyl, alkylphenyl, hydroxyalkylphenyl, and mixtures thereof in which said alkyl groups contain from about 10 to about 18, preferably from about 12 to about 14 carbon atoms; n is 2 or 3 preferably 2, r is from 0 to 10, preferable 0; and x is from 1.5 to 8, preferably from 1.5 to 4, most preferably from 1.6 to 2.7. To prepare these compounds a long chain alcohol (R 2OH) can be reacted with glucose, in the presence of an acid catalyst to form the desired glucoside. Alternatively the alkyl polyglucosides can be prepared by a two step procedure in which a short chain alcohol (R1OH) can be reacted with glucose, in the presence of an acid catalyst to form the desired glucoside. Alternatively the alkyl polyglucosides can be prepared by a two step procedure in which a short chain alcohol (C1-6) is reacted with glucose or a polyglucoside (x=2 to 4) to yield a short chain alkyl glucoside (x=1 to 4) which can in turn be reacted with a longer chain alcohol (R2OH) to displace the short chain alcohol and obtain the desired alkyl polyglucoside. If this two step procedure is used, the short chain alkylglucoside content of the final alkyl polyglucoside material should be less than 50%, preferably less than 10%, more preferably less than about 5%, most preferably 0% of the alkyl polyglucoside. wherein R is an alkyl group having 9 to 19 carbon atoms and a is the integer 1 to 4; R 2 and R3 are each alkyl groups having 1 to 3 carbons and preferably 1 carbon; R4 is an alkylene or hydroxyalkylene group having from 1 to 4 carbon atoms and, optionally, one hydroxyl group. 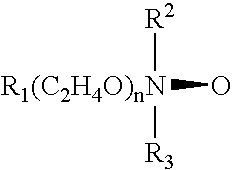 Typical alkyldimethyl betaines include decyl dimethyl betaine or 2-(N-decyl-N, N-dimethyl-ammonia)acetate, coco dimethyl betaine or 2-(N-coco N, N-dimethylammonio) acetate, myristyl dimethyl betaine, palmityl dimethyl betaine, lauryl diemethyl betaine, cetyl dimethyl betaine, stearyl dimethyl betaine, etc. The amidobetaines similarly include cocoamidoethylbetaine, cocoamidopropyl betaine and the like. A preferred betaine is coco (C8-C18) amidopropyl dimethyl betaine. 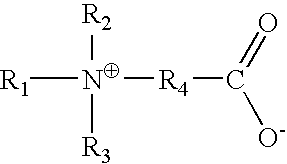 wherein R 1 is a C12-16 alkyl and R2 and R3 are methyl or ethyl. The above ethylene oxide condensates, amides, and amine oxides are more fully described in U.S. Pat. No. 4,316,824 which is hereby incorporated herein by reference. The instant composition can contain a mixture of a C 12-14 alkyl monoalkanol amide such as lauryl monoalkanol amide and a C12-14 alkyl dialkanol amide such as lauryl diethanol amide or coco diethanol amide. A preferred group of the foregoing nonionic surfactants are the Neodol ethoxylates (Shell Co.), which are higher aliphatic, primary alcohol containing about 9-15 carbon atoms, such as C 9-C11 alkanol condensed with 7 to 10 moles of ethylene oxide (Neodol 91-8), C12-13 alkanol condensed with 6.5 moles ethylene oxide (Neodol 23-6.5), C12-15 alkanol condensed with 12 moles ethylene oxide (Neodol 25-12), C14-15 alkanol condensed with 13 moles ethylene oxide (Neodol 45-13), and the like. Such ethoxamers have an HLB (hydrophobic lipophilic balance) value of about 8 to 15 and give good O/W emulsification, whereas ethoxamers with HLB values below 8 contain less than 5 ethyleneoxide groups and tend to be poor emulsifiers and poor detergents. Additional satisfactory water soluble alcohol ethylene oxide condensates are the condensation products of a secondary aliphatic alcohol containing 8 to 18 carbon atoms in a straight or branched chain configuration condensed with 5 to 30 moles of ethylene oxide. Examples of commercially available nonionic detergents of the foregoing type are C 11-C15 secondary alkanol condensed with either 9 EO (Tergitol 15-S-9) or 12 EO (Tergitol 15-S-12) marketed by Union Carbide. Also among the satisfactory nonionic detergents are the water-soluble condensation products of a C 8-C20 alkanol with a heteric mixture of ethylene oxide and propylene oxide wherein the weight ratio of ethylene oxide to propylene oxide is from 2.5:1 to 4:1, preferably 2.8:1 to 3.3:1, with the total of the ethylene oxide and propylene oxide (including the terminal ethanol or propanol group) being from 60-85%, preferably 70-80%, by weight. Such detergents are commercially available from BASF-Wyandotte and a particularly preferred detergent is a C10-C16 alkanol condensate with ethylene oxide and propylene oxide, the weight ratio of ethylene oxide to propylene oxide being 3:1 and the total alkoxy content being about 75% by weight. Condensates of 2 to 30 moles of ethylene oxide with sorbitan mono- and tri-C 10-C20 alkanoic acid esters having a HLB of 8 to 15 also may be employed as the nonionic detergent ingredient in the described composition. These surfactants are well known and are available from Imperial Chemical Industries under the Tween trade name. Suitable surfactants include polyoxyethylene (4) sorbitan monolaurate, polyoxyethylene (4) sorbitan monostearate, polyoxyethylene (20) sorbitan trioleate and polyoxyethylene (20) sorbitan tristearate. The present light duty liquid detergents such as dishwashing liquids are readily made by simple mixing methods from readily available components which, on storage, do not adversely affect the entire composition. Solubilizing agent such as ethanol, sodium chloride and/or sodium cumene or sodium xylene sulfonate and mixtures thereof are used at a concentration of 0.5 wt. % to 10 wt. % to assist in solubilizing the surfactants. The viscosity of the light duty liquid composition desirably will be at least 100 centipoises (cps) at room temperature, but may be up to 1,000 centipoises as measured with a Brookfield Viscometer using a number 3 spindle rotating at 12 rpm. The viscosity of the light duty liquid composition may approximate those of commercially acceptable light duty liquid compositions now on the market. The viscosity of the light duty liquid composition and the light duty liquid composition itself remain stable on storage for lengthy periods of time, without color changes or settling out of any insoluble materials. The pH of the composition is substantially neutral to skin, e.g., 4.5 to 8 and preferably 5.0 to 7.0. The pH of the composition can be adjusted by the addition of Na 2O (caustic soda) to the composition. The instant compositions have a minimum foam volume of 400 mls after 40 rotation at 25° C. as measured by the foam volume test using 0.033 wt. % of the composition in 150 ppm of water. The foam test is an inverted cylinder test in which 100 ml. of a 0.033 wt. % LDL formula in 150 ppm of H 2O is placed in a stoppered graduate cylinder (500 ml) and inverted 40 cycles at a rate of 30 cycles/minute. After 40 inversions, the foam volume which has been generated is measured in mls inside the graduated cylinder. This value includes the 100 ml of LDL solution inside the cylinder. The minimum foam volume with soil is 150 ml. 2. A light duty liquid composition according to claim 1 which includes, in addition, 0.5% to 10% by weight of a solubilizing agent which is selected from the group consisting of a C1-C4 alkanol, sodium chloride and a water soluble salts of C1-C3 substituted benzene sulfonate hydrotropes and mixtures thereof. 3. A light duty liquid composition according to claim 1 further including a perservative. 4. A light duty liquid composition according to claim 1 further including a color stabilizer. 5. A light duty liquid composition according to claim 1 wherein said zinc inorganic salt is zinc chloride. MXPA05010993A MXPA05010993A (en) 2003-04-14 2004-04-14 Antibacterial light duty liquid cleaning composition. ES2277834T3 (en) 2007-08-01 Cleaning compositions which foam after being applied. PT101541B (en) 1999-12-31 Liquid detergent, the nonionic surfactant base, with high foaming.